On August 14th-16th, 2017, The International Union for Theoretical and Applied Mechanics (IUTAM) Secretary-General Professor Henryk Petryk from Institute of Fundamental Technological Research, Polish Academy of Sciences was invited to visit Beijing International Center for Theoretical and Applied Mechanics (BICTAM). BICTAM Chairman, Professor Jiachun Li, BICTAM Secretary-General, Professor Xi-qiao Feng, IUTAM Congress Committee Member and IUTAM-China Working Group Chair of The Chinese Society of Theoretical and Applied Mechanics (CSTAM), Professor Tianjian Lu, and CSTAM Deputy Secretary-General Ms. Yanan Tang met him for discussion. Professor Xi-qiao Feng introduced the development of BICTAM as well as the activities that will be held in 2017, such as BICTAM Master Lecture Series on Mechanics 2017, The 2nd International Conference on Computational Engineering and Science for Safety and Environmental Problems, Sino-Thai Bilateral Workshop for Young Scholars in Theoretical and Applied Mechanics 2017, etc. After the introduction of BICTAM, Professor Petryk shared the experiences of how IUTAM and European Mechanics Society (Euromech) carry out various international academic exchanges. In addition, the discussion also focused on how to seek greater cooperation between BICTAM and IUTAM, and how to get BICTAM more active in the IUTAM activities, how to extend the influence of IUTAM in Asian Pacific Region, etc. 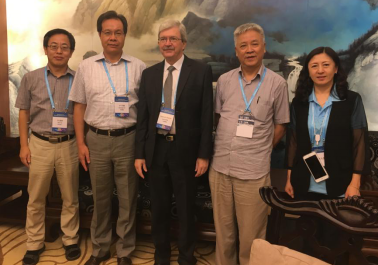 During this visit, Professor Petryk attended the Chinese Congress of Theoretical and Applied Mechanics 2017 (CCTAM-2017) in conjunction with the 60th anniversary of CSTAM. In the opening ceremony of CCTAM-2017 on August 14th, Professor Petryk made an opening remark as the representative of IUTAM and wished CSTAM could get more and more influential in the mechanics community. On August, 15th, Professor Petryk delivered a lecture titled “On characteristic length scales of microstructures in metallic materials” in Micro and Nano Mechanics Session of CCTAM-2017. BICTAM has become one of the affiliated organizations of IUTAM since the year of 2010. These years have seen a rapid growth of BICTAM. We carried out various symposia, workshops, conferences and established a series of brand programs such as BICTAM Master Lecture Series on Mechanics, Asia-Pacific Youth Symposium etc. to promote the development and application of mechanics in Asian and Pacific Region.